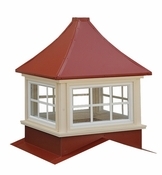 Milford roof cupolas are exactly what you need to add distinction and style to your roof. Whether you’re adorning a home, a barn or a commercial space, these windowed cupolas create balance on a rooftop with up to a 5/12 pitch. Choose from several roof colors for a coordinated look. These weatherproof Milford roof cupolas are made from sturdy PVC and feature aluminum roofs, so they’re ideal for any climate. Our friendly and knowledgeable customer service experts specialize in helping people choose which cupolas are right for their needs, so call us if you have any questions.